And be glad in it and be glad in it. The words are from Psalms 118:24. In fact every day I am glad and am rejoicing in the day and all He has made. My first look into a dissection microscope was the look that captivated me and led me along the path to being a biologist. In November my teacher had brought into class an old moldy pumpkin. One by one we were allowed to take a look at the growth up close. When it was my turn, I looked inside and was whisked away into a crystal palace so beautiful with glistening tubes and knobs that twisted this way and that. I couldn't stop looking with wonder and amazement at the beauty of this lump of mold. Eventually after many minutes I had to go back to my seat as my teacher said very sternly to me: "Susan, go back to your seat." This began my desire to know what is this life that God has created? And so I turned my attention to studying science, specifically biology, as a window into the mind of God. I wanted to see it, know it and understand how everything works and came to be! I am always amazed at the magnificence of the microscopic and beyond to the sub atomic. Here you can see a picture of a bread mold called Rhizopus as seen through a microscope. The little knobs are called sporangiophores and the long slender tubes are cells called hyphae. The huge mat of hyphae that you normally see is called a mycelium. The hyphae branch and re-branch as they spread through a food source. The sporangiophores themselves are intricately complex too. They produce spores which are new individual cells that each make a new mycelium once they find a food source. And so the cycle of life goes on and on for the bread mold. I'm always amazed at the intricacy, complexity, and diversity of all of life. In Psalm 150:6 , the psalmist says "Let everything that has breath praise the Lord." Did you ever just listen to something breathe? I did. Silence. Silence. Silence. Slowly breathe, ever so slowly breathe. 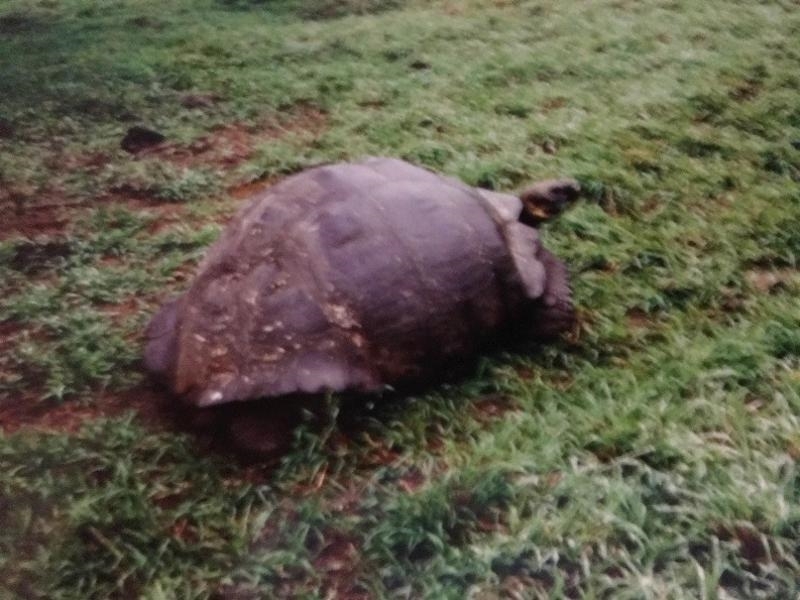 It's amazing to hear the slow breath of this tortoise - the Galapagos Tortoise. Giant, slow, so old, so large, just breathing in and out for over 100 years. I just stood there, watching, listening, appreciating, amazed. Certainly this magnificent animal has breath...was he in his mind praising God? We do not know. But just his existence...his life...his breath is a praise toward our Lord, who not only is responsible for the existence of these animals, but cares for and enjoys them as well. These giant tortoises arrived on the archipelago Galapagos probably 2 or 3 million years ago floating on the ocean 600 miles from South America. Over time they spread to several, but not all of the islands, and diversified to 15 subspecies of which 11 still exist. They spend their days sleeping, resting, keeping cool, foraging in the morning for cactus pads. It is interesting to note that the islands that have never had a population of tortoises have cactus plants that are low to the ground while on the islands that have had tortoises, the cactus plants have adapted to be quite tall - becoming cactus trees as an adaptation to avoid the tortoises. The very large ones can weigh over 500 to 900 lb. and measure 4-6 feet in length. They are highly endangered as after their discovery in the 1500's, their population has been decimated from nearly 200,000 to about 25,000. But that's another story. A few years ago, we were designing our garden and I had noticed how beautiful the newly planted succulent garden in front of thePost Office on Bay State was. I found out that they were Blue Agave and Aloe Striata plants. So we designed our yard and planted them in a row along the driveway. These plants - especially the aloes - have given me such joy! Every winter, they extend a tall bloom (or two or even three this year! ), composed of many tiny orange flowers. The bloom lasts for a couple of months! I enjoy watching them and observing the bees pollinating each one. I think about the miracle of life going on inside those tiny flowers as the two sperm nuclei from each pollen grain make their way to double fertilization of two of the eight nuclei in the innumerable ovules in the ovary at the base of the flower. Then the base of each flower enlarges into a green oval pod. Eventually the green pod will turn brown and split open to release a plethora of tiny brown seeds. The first year I thought to save the seed and try to start the new aloe plants. And lo and behold, I ended up with a huge amount of tiny aloe plants. I have given my prizes away, but some I have planted, and now have many around the yard, which are blooming this winter. Such joy to think about the amazing and intricate reproductive process and the mastery of the endless cycle of life to new life. Genesis 1:11-12 discusses the fact that God created plants such as the grasses, the herbs (green leafy plants for food, usually) that are seeded and fruit trees that have seed inside of them. The verses also give reference to a genetic lesson stating that these plants yield seed and fruit that are of the same kind as the parent plant. Certainly we know that a pine tree does not produce seeds that would grow into oak trees nor would a seed from a spinach plant produce an asparagus plant etc. etc. The best part of the passage, though, is that "God saw that it was good." In other words,the mechanisms that produce plant diversity, plant growth/form, and plant reproduction work very well and efficiently. They were of high quality, adequate or satisfactory. But when you really start looking at exactly how all of these happen in detail, it is astoundingly fantastic. Personally, I love genetics and reproduction, especially plant reproduction. It is not so simple... and most of us just watch it, or don't watch it, with no regard. But to know it brings a wonder to the soul and praise to our Lord. Sue received a B.S. in Zoology and a minor in Chemistry from CSU Los Angeles. She also holds a Masters of Education from Azusa Pacific University. She began teaching in 1973 at Alhambra High School and taught Health, Life Science, Biology, AP Biology, and Chemistry. She established the AP Biology program at Alhambra High School in 1993 and continued to head up the program until she retired in 2011.